« Two New Soundtrack Albums! 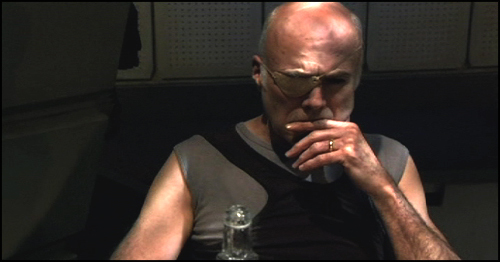 SPOILERS ABOUND: My journey scoring Battlestar Galactica has been long and arduous, but intensely rewarding. I’m only now realizing how deeply it has affected me, on both musical and personal levels. Many experiences stand out as having an incredible impact on me: scoring the destruction of the Olympic Carrier as my first cue on my first professional credit, composing endless drafts of “Passacaglia,” scoring Kara’s literal and figurative self-destruction in Maelstrom. When I first watched the rough cut of Revelations months ago, I suspected that scoring it would be another such experience. But I had no idea what I was in store for. Throughout my life, I’ve written only four pieces that redefined what I’m capable of, compositions that stand above everything else I’ve ever done: works that changes the way I approach my craft. While these transformations are often painful, they are the growth that all artists strive for. The last time I felt this way was seven years ago, when I was still a year away from graduating the USC Thornton School of Music. 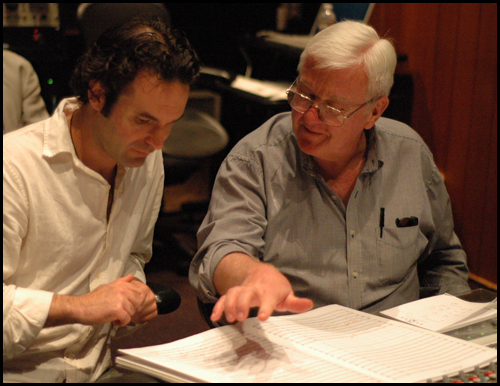 Under the guidance of my mentor James Hopkins, I composed a concert work for mezzo-soprano and orchestra entitled “The Collapse of Saint Francis.” Inspired by the spectacular failure of the Saint Francis dam in 1928 that resulted in over 500 deaths in Southern California, the fifteen minute piece was written in a whirlwind of inspiration, frustration and toil. It was my first orchestral composition, my first vocal work and my first attempt at writing original text (all of which I returned to for Revelations). In retrospect, it also represented a major step away from simple musical arrangements and towards the layered, complex and dissonant harmonic and motivic development I would later employ to great effect on Battlestar Galactica. It was a turning point. Since then, I have written literally thousands of pieces. Some of them have been quite good, but only a few were a struggle. I realized that, for me, the process of writing comes in quick bursts of inspiration, followed by hours of orchestration and arrangement. It’s a perilous trap for an artist to fall into: to stay in familiar territory and write only what you know. 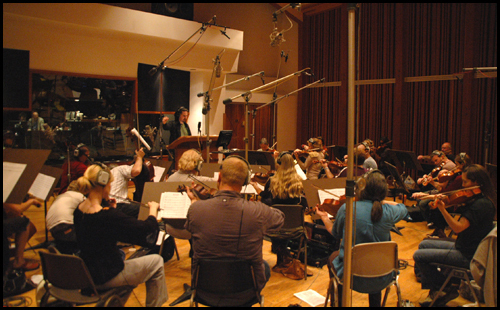 The risk is amplified for a composer working in film and television, since the very nature of the job is to conform music to a scene, on a deadline that allows no margin for experimentation or error. 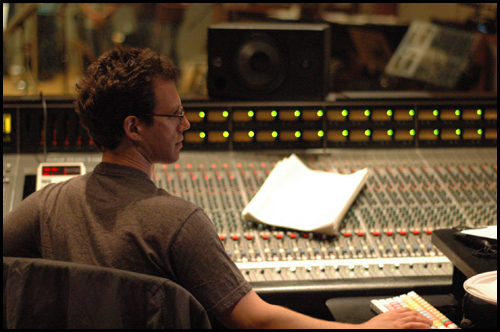 I typically spend no more than a day composing the biggest cues for Battlestar Galactica. And even at that, most of the process is spent in orchestrating and fleshing out my original idea, which is usually conceived in less than an hour. The Oratorio took me a week. During this time, my creative energies were at a new low. I had just finished the two sold-out Galactica concerts at the Roxy and the last thing I felt like doing was writing music again, especially knowing that the final cue had to outshine all my previous work. The entire series has been leading to the discovery of Earth, and the music needed to match. And so, I threw myself into the darkness and was lost. I struggled, doubted and erased. I threw out draft after draft, started over time and time again. I lost sleep. My dreams were filled with the fear that if writing a worthy piece of music were not actually impossible, accomplishing it would merely raise the bar for next time. None of this pressure came from producers, or deadlines or anything to do with my job. I was again reminded that the most terrible pressure comes from within. The process was more psychological than musical. I had to somehow escape the anxiety of topping myself, and focus on the simple task of writing notes. After four days of misery, I stumbled across a simple, musical idea which I felt had potential. After this breakthrough, the composition came relatively quickly. In the end, the intense frustration yielded creative rewards to match. 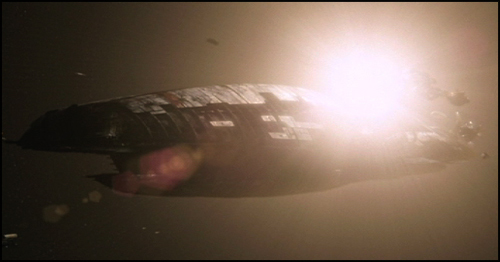 On a very personal level, “Diaspora Oratorio” is my first piece I feel has lived up to the promise of “The Collapse of Saint Francis.” It is easily my most significant musical achievement to date on Battlestar Galactica, Whether or not it becomes a fan favorite does not diminish the impact that writing it has had on me. However, when “Diaspora Oratorio” was done, my task was far from over. I still had to score the remainder of the episode (and after that, The Hub as well, due to a swap in the delivery schedule). The result of that incredibly creative three-week period is on display before you tonight. It is first heard as she is escorted through the glimmering hallways, played by Chris Bleth on the duduk. The arrangement is both mysterious and menacing, communicating her enchantment with the new surroundings, but also adding a hint of darkness to her motivations. 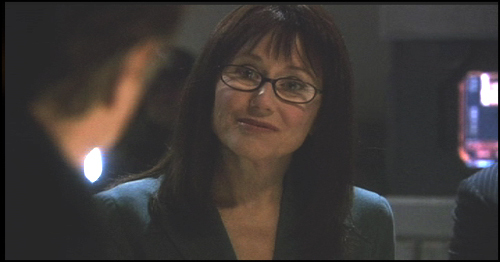 The theme returns, played by Paul Cartwright on the electric fiddle, when Tory reveals to Roslin and Baltar that she is a Cylon. The melodic theme represents Tory, but the arrangement of it plays more towards Roslin’s utter astonishment and confusion. Laura collects herself and shows humility, pleading with Tory to use her influence to speak with D’Anna. Warm strings and a steady frame drum pattern accompany Paul’s electric fiddle, adding a fleeting moment of hope to the scene. But, when Tory asserts herself and refuses to help, the score is stripped down to a single, ominous low note. The Final Four theme was conceived while I was arranging Bob Dylan’s “All Along the Watchtower” for Season 3′s Crossroads, Part II. Until this episode, that signature melodic line was the only musical idea I had extracted from my arrangement. But, I’d always wanted to also incorporate a memorable rhythmic idea as well. Replacing the electric guitars this time around, were a volley of taikos and frame drums, accompanied by clanging strums on the yialli tanbur. And rising above the slamming riff, the duduk, zhong hu and electric violin wail the Final Four theme. The entire cue is only 25 seconds long, but it might be my favorite use of the theme yet. This is the first time in the series that I’ve not completed the musical phrase. Two notes before the end of the theme, the drums swell and we cut to black. This sudden cut-off helped amplify the incredible tension between these two old friends. Cutting the theme short felt like a subtle way of suggesting that their fraternal bond is tearing at the seams, about to break. The second act opens with a gorgeous montage of Tigh being escorted to the airlock, while Adama breaks down into a fit of rage. Here, the orchestral strings take center stage with a lush, lyrical piece, similar in arrangement to works like “Passacaglia” and “Allegro.” But this piece is very different. There is no familiar theme to give it meaning, no melodic ideas to comfort the audience. The story is veering into strange, uncharted territory now, and I wanted the score to amplify the audience’s sense of confusion and delerium. We are trapped in a bad dream from which we can’t awake. Unlike previous Battlestar string pieces, this one becomes increasingly dissonant and disorienting. Passing by in a brief 60 seconds, it changes keys 4 times, percussion grooves enter and disappear, and the harmonic lines set against the simple theme become crunchier and more awkward. Scenes like this are the kind I live for, because they are completely emotional, and without any exposition at all. It only takes ten seconds to communicate the logistical realities of who is being marched where, and who is upset with whom. But, the rest of the minute is dedicated to showing the despair, the confusion, the frustration and heartbreak. Anders confesses and the truth hits her like a bomb. A solo duduk finishes their Love Theme over a dark, ethnic 6/8 groove (with hints of tabla and sitar representing the Final Four Theme). I haven’t used their theme for a long time, but I felt strongly that it should return at this moment. Despite the huge story arcs woven into Revelations, this particular scene is about only one: Kara realizes that she must love Anders, because her first instinct is not to kill him. 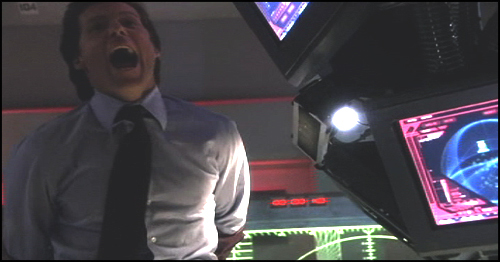 This cue represents the first time you’ve ever heard a full choir on Battlestar Galactica. 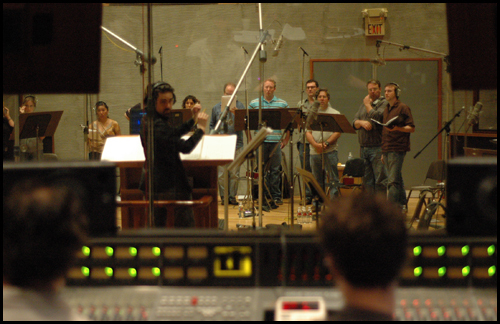 We recorded the choir, contracted and led by the lovely Bobbi Page, at Henson Studios, the same day that we recorded the strings and brass. All combined, this makes Revelations the biggest episode I’ve ever done. The choir sings some lovely passasges here, including a beautiful statement of Kara’s theme as she looks around her Viper’s controls. Indeed, one of the most powerful moments is the score dropping silent for a beat when she discovers the signal. The cue reaches a fever pitch after Lee takes the key and a Sharon tells D’Anna that they have weapons lock on the Colonial fleet. Here, I used one of my favorite compositional devices, a metric modulation, to take the intensity to extreme levels. The drums are playing a dotted 8th rhythm (at 94 bpm), giving the groove a lulling, triplet feel. But, the tempo changes without you noticing, so that those dotted 8ths become quarter notes (now at 125.32 bpm). When the subdivided 8th notes in the shime daikos kick in, suddenly the rug has been pulled out from under you: a new tempo has taken over the cue. But, we don’t stay at the new tempo for more than a few seconds. 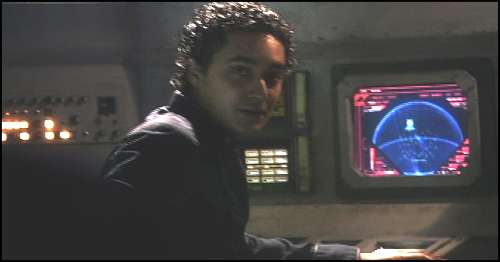 As Lee prepares to airlock Tigh, the tempo increases, growing faster and faster until it reaches a furious pace. At last, Kara stops him and the intense sequence comes to a close. From here to the end, Revelations veers further into unforeseen narrative directions. What began as a standard nuclear-hostage story, similiar to Eye of Jupiter, suddenly becomes the story of a fragile alliance. 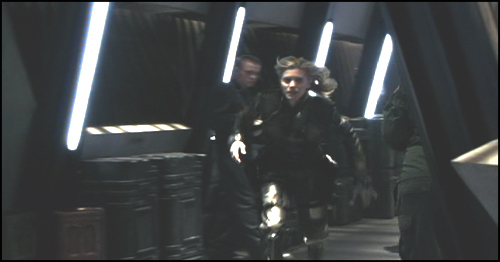 The alliance is formed as D’Anna and the Cylons meet with Lee and the Colonials before Kara’s mystery Viper and see the phantom signal for themselves. As the final four tell her that they believe the signal leads to Earth, the Final Four theme returns. It is again played by Paul Cartwright on the electric fiddle, but is now in a completely re-harmonized context. The C#m, A and D chords that give the theme its dark, Middle Eastern, brooding quality have been re-ordered, placing the emphasis on the A major instead of the C# minor. As a result, the theme is melodically identical, but sounds completely new. The dark ambiguity has been replaced with a lush, lyrical arrangement. Thus, the Final Four theme has come full circle as their story arc of living in secrecy essentially concludes (for now). “Diaspora Oratorio” spans across the entire final act, except for the last minute. It is a five-minute work for full orchestra, SATB choir and ethnic percussion and soloists. The choir is singing my original text, translated into Latin by Michael Speidel. 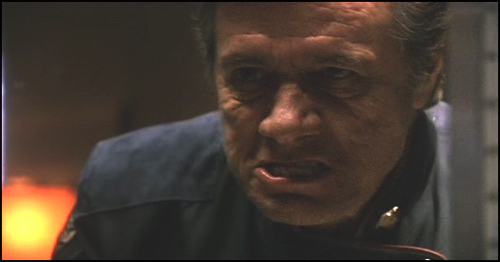 The voices functions almost as a classic Greek chorus, commenting directly about the action on screen. Traditionally, an oratorio is a composition for orchestra and choir that also features soloists, who often portray specific narrative characters. I think of the form as an opera without the physical staging or blocking. ”Diaspora” is an oratorio in the traditional sense, although it is obviously much shorter in length, perhaps a Mini-Oratorio. Writing the text, I tried to imagine a passage from a classical Caprican text, something akin to their version of Homer’s Odyssey. I envisioned the end of a long sea voyage; ancient wooden ships cutting through the mist to find their homeland. While the text for some of the choral passages are written from this perspective, other lines directly comment on the events on screen. The result is a text that feels like it was written for another era, but is also inseparable from the storyline. This melodic idea is the seed of the entire piece. After composing for four days, these six notes were all I had! But, it turned out to be virtually all I needed. The fleet jumps into uncharted space, and with it, the harmony leaps from Ab back to D major, the largest harmonic leap possible in Western music. The violins, sopranos and altos state two dissonant contrapuntal lines that ultimately resolve to a major triad. The arrangement is stripped down to a solitary, suspenseful high D in the violins as Gaeta turns to proclaim “Visibile constellations are a match.” An uncontrollable excitement begins to bellow up, first seen in Roslin’s reaction to these words. The choir and orchestra enter with a fierce and energetic swell, that crescendos further on the reveal of the fleet approaching Earth. 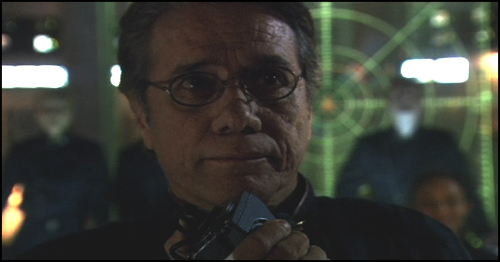 The huge swell cuts off suddenly, leaving a lingering string chord in its wake as Adama picks up the intercom, to make the speech we’ve been waiting for since the miniseries. For this speech, I abandoned the text’s distance from the story and allowed the choir to take on a more literal, narrative quality. 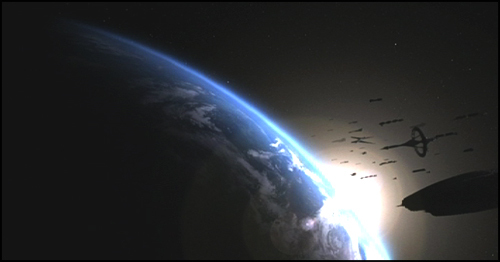 In fact, the final line, “We have arrived at Earth,” is stated by the choir at the exact moment that Adama says it himself. The shime daikos play a steady quarter-note-triplet pattern, set against the choir which ignores the triplet feel. As Lee leaps atop the table, the nagado daikos and dumbeks kick into a faster triplet-eighth groove, which essentially resolves the rhythmic conflict between the shimes and the choir, adding considerable excitement and forward momentum to the score. 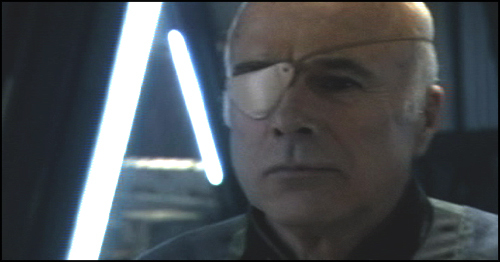 The line “Not for the fallen, but for the unforgiven” lands on the reveal of Col. Tigh, alone in his quarters, adding another layer of melancholy, without diluting the cue with too much darkness. 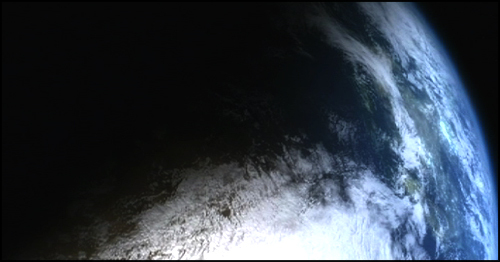 But of course, the episode does not end on the serene vision of Earth from above. The final minute of the episode completely strips away the uplifting emotion of the previous scene, making it one of the harshest twists this series has ever pulled off. And it worked beautifully without score. The lonely ripple of ocean waves and a distant thunder clap, recorded and edited brilliantly by Daniel Colman, perfectly communicated the desolation they faced. The promise of Earth has kept them alive for four years and now they finally find it, a nuclear wasteland. Any music here would only serve to dilute the power of this crushing scene. And with that, we are left with a long wait before us. I can say little about the last ten episodes except that they are astonishing, delivering on the promise of Revelations and more. 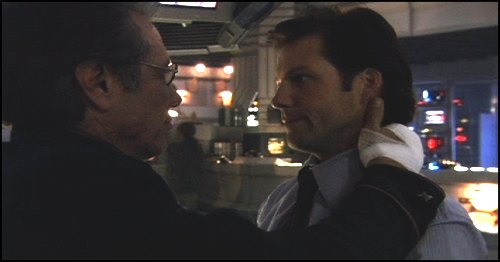 And I’m certain that the final episodes of Battlestar Galactica will also represent another personal turning point for me. I will undoubtedly have to write a score even better than Revelations. At least I have another ten episodes to do before I have to face the fact that my journey on this series is coming to an end; it will be coming to an end for us all. 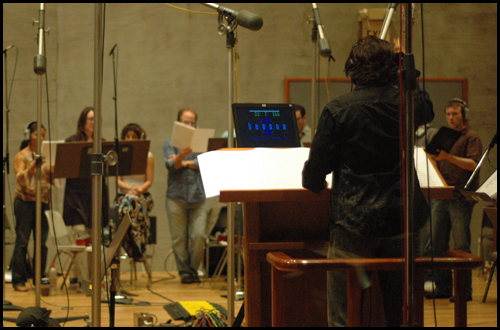 PS: For more high-resolution pictures from the Revelations scoring session, check out ScoringSessions.com. Thanks to Dan Goldwasser!